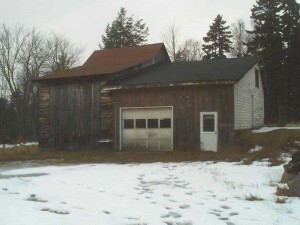 The old garage/shed on Temple’s property in 2009, which he began to update and reconstruct to make his woodworking shop. 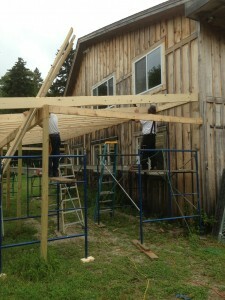 As the hot summer months are winding down, more and more woodworkers are getting back into their shops. One of these woodworkers is Temple Blackwood, who we featured last month in The Highland Woodturner in our Show Us Your Shop Column. When he submitted his shop to us, he was still in the process of building the south-shed roof, which would be able to shelter his 1964 International 424 Tractor as well as firewood for warming his shop and home. We are excited to report that he has recently finished this addition and we wanted to show off the before and after pictures! In mid-coastal Maine we are always in need of more covered shelter from the elements, and the new shed provides that for various tractors and small boats. 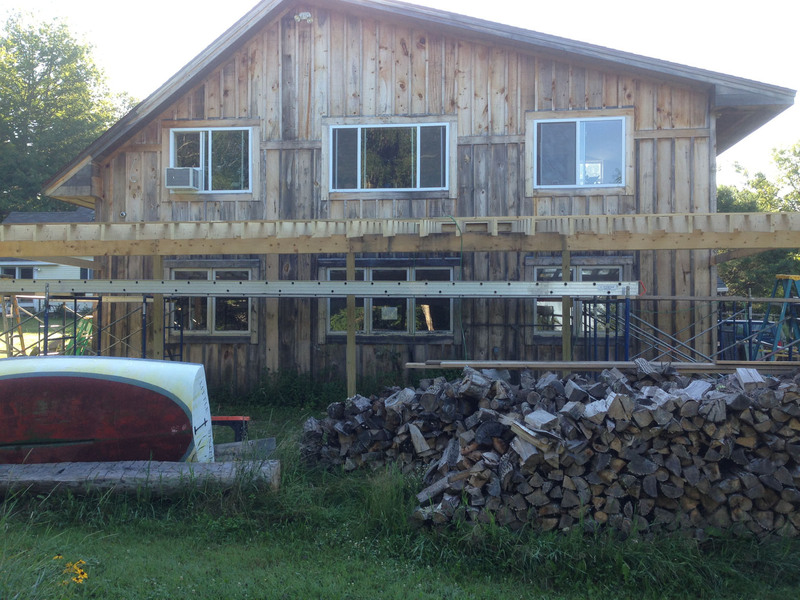 The walls will become half-walls built of future firewood when my oldest son and I process the nine cords of logs we have ready in the yard for the cooler weather of the fall. 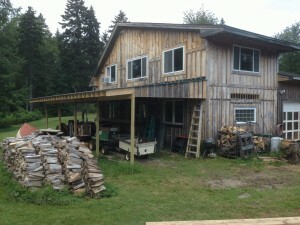 We heat both houses, my shop, and my office with woodstoves through the winter. The design of the extended roof eve 4′ beyond the posts will basically shelter the fire wood that will be stacked between them to a height of 5′ leaving the upper level open for the light and view and accessible from either side. The extended steel roof also keeps the shop noticeably cooler in the summer, an unexpected benefit, while protecting the shop from the blinding glare of the lower sun early to mid-afternoon in the winter. That bright sunlight of a lower sun offered no heat and made it impossible to work anywhere in the shop without shuttering the west windows with cardboard blinds. Using the summer August visit of my two other sons with their families as a deadline (i.e. 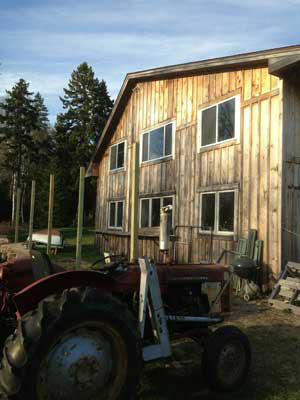 to complete the work before they arrived so they would not be enlisted while on their vacation) and to begin toning up for summer after an early spring carotid artery surgery, I hand-dug the post holes through the gravel and rocks in early May, squared and planted the five exterior posts leaving them to settle in until mid-July. 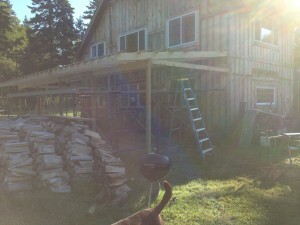 In the meantime, I hand-cut the joints and squared and tied the outside perimeter in preparation for moving forward. Given the nature of my aging frame and the physics of the 16′ joists, batons, and steel roofing sheets, I convinced two of my local contractor friends who own scaffolding to come help me for two days, and we built the new shed to completion three days before my family arrived. Needless to say, my grandchildren enjoy playing in it on rainy days, but with summer sailing coming to an end, field mowing nearly completed, and the prospect of needing to keep one year ahead of the firewood piles, the new shed will be full. We will doubtlessly be wondering where to put something else, and I suspect my wife has plans already made!